The group has been hard at work bonding and fundraising for this summer’s trip to Colorado. While we are on this journey together and want to keep everyone updated below are a few fundraisers coming up. Soup and Sandwich March 13 and April 10 serving from 5 to 6:30. We will be working hard in the kitchen making soup and grilled cheese sandwiches. Come after or before worship for fellowship and food! A free-will offering will be taken and all proceeds will go towards the costs of the trip. June 2019 fourteen students and adults will be traveling to Colorado Springs, CO for a week to serve alongside the community. We are preparing for our trip through various fundraisers, events, service, and worship. We want you to get to know the group better so each month you will find a blog post that introduces some of the group. Today we start our first post for the upcoming trip. Hello, my name is Katelyn L. I like to travel and spend time with my family. Some reasons why I’m going on the trip would be that I do want to travel more and also to help out people because I love to help out a lot for some reason. I also want to spend time with friends and to grow a better connection with God. I look forward to helping out people and maybe construction work. The one thing I’m nervous about is what it will be like there and how everyone will work together but I do believe we will all work together and have tons of fun. Hi, my name is Abby E. A fact about me is that I have a twin sister. Some reasons why I am going on the mission trip is because I am excited to travel and be with my friends. I am also excited about this mission trip because we get to help people. I am looking forward to this mission trip to grow a better relationship with God. Something I am nervous about the trip is what it’s going to be like there, but I’m thinking that we are all going to have a lot of fun and work well with each other. Today (7/19), working on the deck of the old middle school was successful. Our group (Janae, Kristina, Calle, Madi, and Leigha) continued to work on the picnic tables and putting boards back down on the deck alongside the other half of our group from Illinois. We got a lot accomplished and we were all super happy. We have three main projects going on at the moment. We have a group of people on putting the deck boards back in, another working on the 4x4s, and the last working on picnic tables. Each of the projects requires drills to complete what is needed to be done. One of our two drills started smoking so we were eventually down to one drill. Instead of being stressed and argumentative towards one another, we were all calm and still happy. We rotated the drill around to the different groups working. Over this, we made a lot of progress despite our desperate need for more drills. We also bonded even more during our lunch. It’s been a great week and I am so thankful to have met the group from Illinois. We made it to West Virginia! After two long days of driving (15 hours which felt like 20), we made it to West Virginia ready to serve and eager to see God’s work working within us and the community of Clendenin. Yesterday brought us through Chicago for some deep dish pizza and to explore the city (which did not happen… yet). Well, the deep dish took a little longer than anticipated so we decided to do some team building at an escape room and are saving the city for the journey back. WE ALMOST ESCAPED (only 25% escape the room we were in), but to be fair we had the hardest room and none of us had EVER done an escape room. Then we continued on to Indianapolis for a good nights rest. Which was much needed after a long days drive. Onto Sunday, we joined the great people at Ressurection Lutheran church in Indianapolis for worship – Beautiful church, if you ever go through and get a chance, stop – they were a great host church! Our journey then took us to West Virgina, with a few stops for food and gas but we made it and are tired but excited! Thank you, everyone, who has been praying for us and those who donated. Follow the journey through this blog each day! Author ourredeemerpinecityblogPosted on July 17, 2017 Leave a comment on We made it to West Virginia! 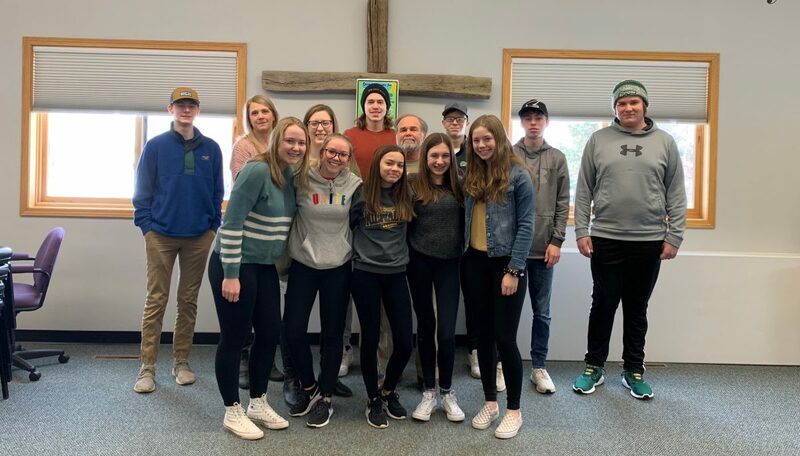 This year 10 ORLC sr. high youth and adults will be traveling to Clendenin, West Virgina for a week (July 15-23) of service to help the community after the devasting flood last summer. The work will be doing is based on community needs that are identified in intentional conversation through Next Step and the community. Come and hear more about this service and work on July 9th before we leave and join us on August 6th for reflection about this experience. “In late June 2016, massive flooding ravished through the Appalachian hills of West Virginia. Many towns were affected by the floods, however, by the grace of God, our ministry home of Rosedale, WV was passed by with very little flooding and damage. In the days after the floods, community members in Rosedale, alongside our Next Step volunteer teams put our work in Rosedale on pause and moved to neighboring towns to assist with the response efforts. For six weeks, Next Step teams “mucked” and assisted homes in nearby Clendenin, who experienced some of the worst flooding in West Virginia. Residents of Clendenin described the “whole town” as being under water, with floodwaters reaching nearly 35 feet in areas on the community. The storm left extensive damage but also opened the door to some beautiful new relationships in Clendenin. Because of these two factors, Next Step has made the decision to continue its relief efforts in Clendenin, WV for the summer of 2017. Our Redeemer Lutheran Church – Pine City, MN Blog at WordPress.com.